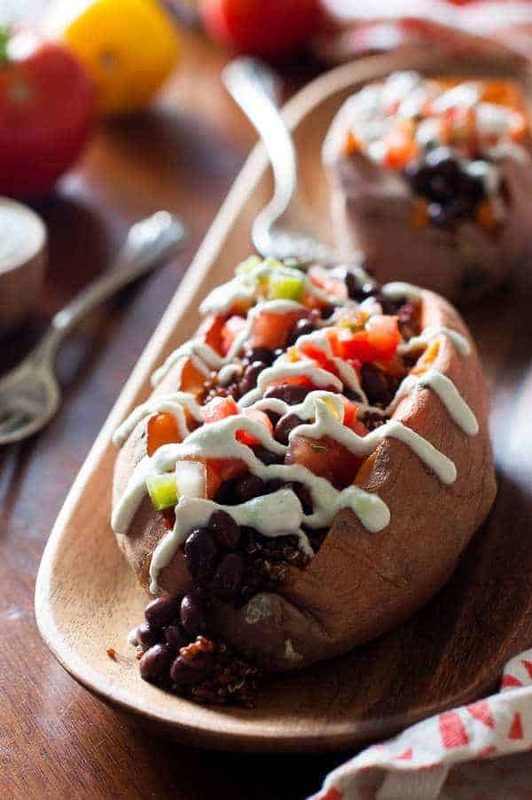 This southwest Vegan loaded sweet potato with a tomatillo crema recipe is the best ever. This is delicious but the tomatillo crema makes this recipe. Whether it was at home or at a restaurant or other location, growing up I always enjoyed a good baked potato with all the toppings on it including cheese, sour cream, bacon, green onions, tomato, olives, etc. I stopped eating it that way and now I eat this healthier version and I don’t feel guilty. This is also more hearty and makes a complete meal, especially if you are on a Vegan diet. 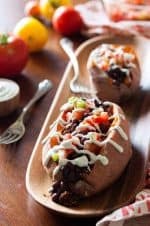 I hope you enjoy our southwestern Vegan loaded sweet potato with tomatillo crema. I made this baked Vegan loaded sweet potato southwestern style and added a vegan sour cream crema using pureed cashews. It is so delicious everyone will enjoy it. People who are vegan can make it for themselves and others to enjoy. They can make just one crema instead of worrying about two cremes! The tomatillo gives it a little zing and southwestern flair. Brown rice could be used in place of the quinoa if desired, as well as any other grain, really. This meal is easy and doesn’t take much effort, especially if you make your black beans in the crockpot ahead of time and freeze them. I do that all the time. They taste so much better than black beans from a can and cost a lot less. I like to freeze them in little individual serving size containers since it seems like whenever I open a can of black beans, I waste half the can. Then to make your quinoa easy, cook it in an Instant Pot (it only takes 12 minutes once it’s up to pressure). Don’t let the recipe hold you back on what you want – you can take something out or even add something you think would taste good with this meal. Use our recipe as a base and make it your own – cause after all you are the one eating it. 🙂 I would love to hear how you customize this recipe to make it your own. Mix ingredients together and season, to taste, with salt and pepper. The 9 Best Clean Eating Pumpkin Recipes – Fresh Pumpkin is the Best! 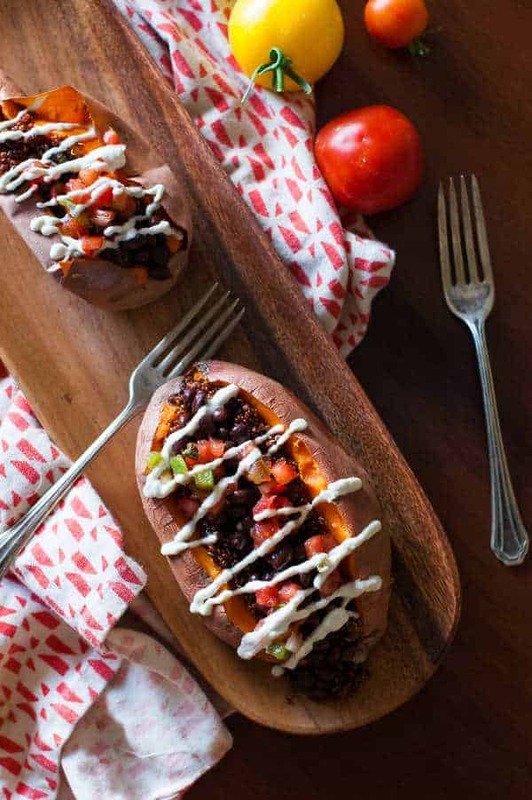 This Southwest Vegan loaded sweet potato is simple and satisfying with black beans, red quinoa and topped off with a homemade tomatillo crema dressing. It is perfect for a quick and easy weeknight meal. Place the sweet potatoes on a baking sheet. Bake for 45-50 minutes, or until soft. Heat the black beans in a small saucepan with the garlic. To assemble: Slice the sweet potato across the top, cutting all the way down to the bottom of the potato. Pinch the ends together to open up the potato. Fill each potato with 1/3 cup warm quinoa. Top the quinoa with 1/3 cup black beans per potato. Top beans with 2 tablespoons pico de gallo per potato. Drizzle the tomatillo crema over the top of each potato. A vegan and dairy-free sour cream made with pureed cashews. Everyone will love it and you will only have to make one creme for everyone. The tomatillo gives it a little zing and southwestern flair. Place the cashew in a bowl and pour hot water over to cover. Let soak for at least 1 1/2 hours, overnight is best. Drain the soaking liquid and place the cashew in a blender along with the remaining ingredients. Blend until very smooth, scraping down the sides of the blender as needed. Add salt to taste. I tried this recipe tonight and it was wonderful. I did cheat on the Pico de gallo and bought some from the deli at Publix. The Crema was so easy and delicious! Fantastic; thank you!